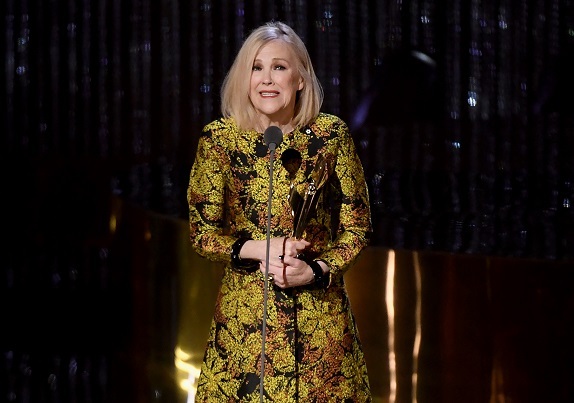 “Schitt’s Creek,” which streams on Netflix and airs on the cable network Pop in the United States., also was named best TV comedy. The comedy went into the awards show with 15 nominations, according to The Hollywood Reporter. “At the very beginning I’d whisper my ideas to Dave Thomas and he’d say them out loud, but he wouldn’t say, ‘Catherine said …’ He’d say the idea out loud, and if it didn’t get a laugh I’d stay quiet. That’s what an insecure weasel I was. If it didn’t get a laugh I wouldn’t say anything, but if it got a laugh I’d go, ‘I said that! I told him to say that!’ It was like I had to go through the test kitchen of Dave Thomas!” she told Vulture with a laugh. “The sexism was still a holdover at that time. That generation of guys had been raised by an older generation, and depending on who raised them, they looked at women a certain way. But because they also did character work and not stand-up, I think they weren’t just working from their own ideas, so they were open-minded. I love those guys, and no one was ever cruel. It was just a case of numbers, and that was a product of the times. There would never be more than two women in a cast of Second City stage. While she working with The Second City and “SCTV,” O’Hara said there were limits because of her gender on the kinds of characters she could creatively portray. “Schitt’s Creek” is in the midst of its fifth season. Last month, series co-creator Daniel Levy announced on Twitter that the sixth and final season of the show is slated to air in 2020.